I had the pleasure of hearing Carol Jantsch (principal tuba of the Philadelphia Orchestra) perform last semester at the University of Iowa. Carol definitely breaks the mold of society’s image of the typical tuba player. 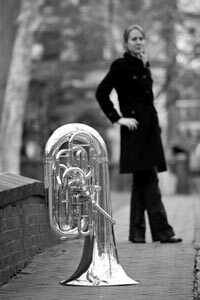 She won her position in the Philadelphia orchestra in 2006 when she was a senior at the University of Michigan, and she was the first female tuba player of a major symphony orchestra. While attending her recital, I was blown away by her amazingly clear tone, ability to play long, musical phrases, phenomenal technique, and efficient use of air. Carol, you are an inspiration to all women brass players- keep doing what you’re doing! This video is hilarious. Watch, then buy Carol’s CD. Your mama wants a CD.